Thanks to some great people including one very generous 11th hour pledge from an annual visitor to Devon we have reached our target. A very BIG BIG THANK YOU from everyone at Plymouth Bike Hire. We are able to go again next year. We had a great night. Thanks to The Pig for hosting and CJ & The Cooperative Big Band for performing. We raised another £200 in cash and it’s donated today. BIG BAND BIG THANK YOU. 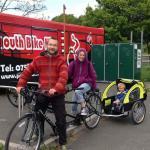 Let’s keep families cycling. So many good times for so many groups and families - all ages. We need to keep this going next year.